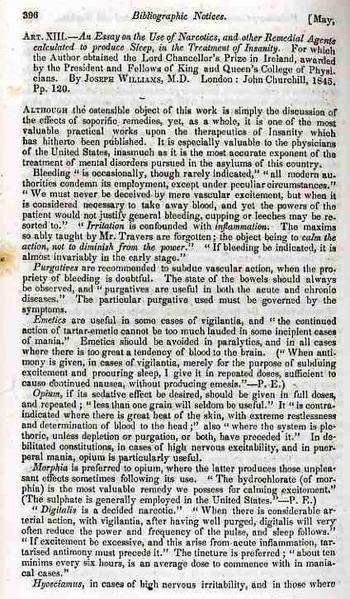 This book review on the use of narcotics in treating the insane appeared in the New York Journal of Medicine for 1846. The book, An Essay on the Use of Narcotics, and other remedial Agents calculated to produce Sleep in the Treatment of Insanity…., was by Joseph Williams, M.D., and was published in London in 1845. The theory behind the sleep treatment was that the basic mechanism of insanity was “cerebral inflammation” or “excessive vascular action” in the brain—inducing deep sleep, evidently, was a good way to combat the over-active brain. In this article we find sleep assaulted by the use of the following: purgatives (“to subdue vascular action when the propriety of bleeding is doubtful’), emetics, opium (to be used “in cases of high nervous excitability and in puerperal mania”), morphia (“the most valuable remedy for calming excitement”), hyosciamus (“to produce sleep, tranquilizing the irritability of the insane”). It is weird to see that the last sentence in the description of hyosciamus reads “some fatal cases have occurred from exhibiting henbane as an enema”. A narcotic enema? Still to come in the review is conium (“I have used it frequently and in large doses…it is chiefly valuable as a deobstruent and alternative”, followed by camphor, Belladonna, hydrocyanic acid, colchirum, stramonium aconite, and others. 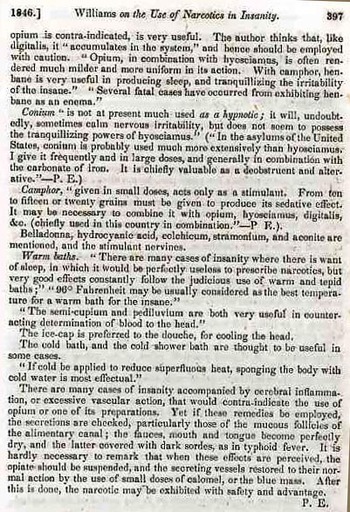 “Warm baths’ makes an appearance (“90 degrees may be considered to be the best temperature for a warm bath for the insane”), as do cold baths, and the applications of ice caps. I’m not so sure about what to make of it all, the sleep treatment of insanity I mean—after all, Joseph Lister only makes his epochal pronouncements on cleanliness in the operating theatre 15 or so years after this paper, which seems today to be the most rudimentary thing that one could do in treatment in the surgical room, so treating extra blood in the brain through drug-induced sleep doesn’t seem all that far away from the realm of possibility back there in early Victorian England. I don’t think I’ll forget the toxic narcotic enema any time soon, though. Or the word “deobstruent”. Several years ago I purchased part of the papers of David Katcher, who was the founding editor of the journal Physics Today. Before that, several years before that, in 1945, David Katcher was Lt. Katcher, serving as a correspondent/writer in the public relations office of the U.S. Army Headquarters of the Western Pacific (GHQ USAFPAC), and seems to have worked closely with the U.S. Commissioner to the Philippines, Paul V. McNutt. There was a 6-inch stack of paper here of mimeographed offprints of the daily grind of running the PR department of the Army in the Philippines, which, taken as a whole, is pretty interesting, showing the concerns and trials of the Army in reestablishing the government and infrastructure of the country. Some of the individual reports/publications are stand-alone, straight-up f interesting things, and so far as I can determine, have not been published anywhere else. The item I'm about to describe is one of those stand-alones. This two-page document seems to have been the draft for a press release on re-starting the formerly Japanese occupied San Miguel Brewery in Manila. (I don't need to say very much about how tremendously devastated Manila was after MacArthur came back and reclaimed the city, as I think that this is generally understood and a given. It was enormous amount of loss of life to Philippine civilians, with estimates of those killed in Japanese massacres at 100,000+, plus battle casualties, and of course a tremendous amount of destruction laid to the once-beautiful Manila that went along with that.) Putting the city back together again after the end of the war was obviously essential, and the movement with the brewery was evidently very quick. The brewery evidently suffered minor destruction (I suspect in the final fight as the Japanese occupied and ran the brewery during the war) and although the structures were lined with explosives, “the Japs forgot to blow the mines”. There were a million things to do in Manila in 1945, and the resurrection of the San Miguel Brewery was one small part of that. It is interesting to see this internal U.S. Army document to see how this was refitting was being transacted. Squidward Tentacles (of Spongebob Squarepants fame) once had a dream of the future--I mean, a dream with the future in it--in which everything in the sea was chrome plated, except of course for the water. His vision (which he liked at first for its shineyness and then hated soon afterwards for it shineyness) of the future may have involved a vision of the past as well as someone else's vision of the future. Anyway it is my mentality that pulls up Spongebob when looking through this fine 1937 pamphlet1 on architectural/design uses of stainless steel, where there was so much shining and shimering matteness constructed using steel and chromium, which comes a little close to Squidward's chrome sea bed. But not really. In any event, these are lovely creations, best served up in glorious black & white. Department of "What is It?" (#9) A New Way of "Conducting" War. The hint for this WIT? is already given in the title to the exercise--that said, can you figure out exactly what is going on here? It is a lot more complicated than you'd think, but at least part of the answer is pretty much a given when looking at the patent drawings. The tricky part of the answer here is knowing how this thing would be so lethal. In any event this thought came to mind with the mostly-19thc practice of showing the lengths of rivers and the heights of mountains to scale in atlases, though especially with the representation of lakes and islands (and waterfalls!) which to my experience are much more uncommon sightings. All of this leads me to this fine work (below), which surfaced again this morning--a representation of lakes and islands on the same scale, and printed in 1856. I don't know at this point how much earlier these things get for lakes/islands, but it seems that they wouldn't be very much earlier than this. 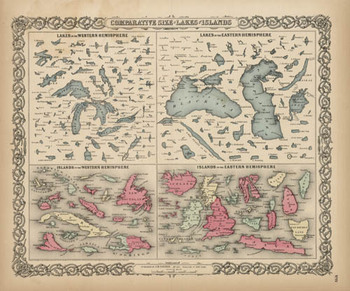 SO, 18561 may have been tone of the earliest times that these 150+ lakes and islands of the Western and Eastern Hemisphere were ever been printed on the same page and in the same scale exclusive of their associative land masses and placed contiguously, side-by-side. They were, of course, seen in a common perspective before on any world map, but I think that this is the first year in which the islands and lakes of the world were displayed without oceans and land masses, and the effect is a little odd. If you take away the color and the text the image takes on a very definite biological flavor (I keep thinking of that tiny bone in the ear for the small lakes…) In any event it is far easier to compare these features without the distractions of the non-lakes and non-islands clouding and confusing our perspective fields. This was also the beginning of the heyday of publishing comparative this-and-that in atlases: from 1840-1880 or so was the period in which the majority of descriptive comparatives were published. This is when you would see comparatives of the lengths of rivers and the heights of mountains and waterfalls beautifully displayed in atlases. I don’t know what happened after then, but the publication of this sort of data really fell off, with the heights of mountains/lengths of rivers stuff relegated to filling the empty areas in double-hemisphere world maps. 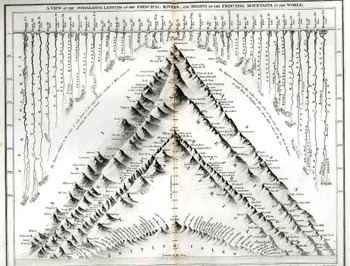 Here’s a relatively early image of this type called “A View of the Comparative Lengths of the Principal Rivers and Heights of the Principal Mountains in the World”, published by Orr & Smith in London (1836), featuring 44 rivers and a hundred or so mountains. It is a lovely and graphically pleasing work, and an early effort in displaying the dissected river and mountains in such a forensic-like way. This I think is my favorite genre of specialty map, and, for now, I’d just like to surface this map by George Colton, and admire it, and try to imagine the kind of impact it must’ve had on people back there in 1856 who were seeing this sort of data displayed so for the first tine. It would have been a huge revelation to see the lakes and islands compared side-by-side; it was a fresh, new idea, and an insight in how to look at things in general. When i was a kid I watched a marionette-action show called Supercar--it had a high creep factor to it what with the marionette eyes and mouths and all, but I watched it anyway, I guess, because that was probably the only cartoon being broadcast at that hour. (It was filmed in "Supermarionation", which utilized electric moving parts in the marionettes in addition to string controls. It was the brainchild of Gerry Anderson, who also brought you Fireball XL5 for which I can still sing the theme song.) And that is what struck me seeing the reasoning for this "atomic bomb car"--it really is just a car with a high creep factor that is outfitted for camping, but it is being sold in the patent as a ways for urban dwellers to survive the coming nuclear holocaust (" our greater areas of human congestion have slowly begun to face the threat of eventual atomic destruction"). Since we find the cost of reallocating everyone and all business everywhere in the US so that there is no real profile for nuclear attack because everything is spread out (or underground), it means that people in targetable cities are more or less doomed because they won't be able to get out of town when the bombs come. And then this, in classic patentese: "The primary object of this invention is a practical means of implementing and temporarily maintaining mass diffusion from congested areas threatened with atomic attack, and in a manner related to proved public preferences, to mass production techniques and to prevailing trends". "Yet, once some practical: i. e., simple and economically possible, means is found for making the average car quickly convertible to housekeeping use, then the threat of the atom bomb to our cities loses some of its menace. Once swift mass diffusion is properly implemented, it becomes susceptible to military organization. The city might be bombed, but its population could be saved. Anyway, the car is basically a camper, though it is still just a car. I've got to give the guy his credit because there are some interesting ways in which seats fold and are made into beds and tables and such. There's enough in this patent to suggest that what we are dealing with is more than a simple salve me fons pietatis, that it is more than just a car with convertible beds that is renamed something like "High Speed Survival Encapsulator and Escape Vehicle". And the vast dependent clause for the utility of this vehicle to save U.S. civilization is for (1) millions of people to evacuate a high-density location in an orderly fashion and given the time to do that in, and (2) there was no "2". So, once you get fair warning and make your way out of the city in your bubblecar to the fresh countryside, loaded down with family and water and food and toilet paper for a few weeks and 10 cartons of cigges per person, you'd be on your way to surviving in Tomorrowland. It is a Supercar--it just doesn't fly, or doing anything particularly special. Probably though you couldn't fit much else in there because it is already filled to the brim with audacity and hope, and a certain stink. Well, this was just one King-Hell tough place to work. Not only were the conditions cramped, and the air not-good (and occasionally deadly), and dark, and humid, but the work itself was hard. The guys in the detail of this woodcut below were sweating away in an inverted box on the riverbed of the East River (NYC) with thousands of tons of stuff on top of the box. The box was actually a caisson1--a nicer French word ("case" or "chest") for the box--and it was a designed object for bridge construction for establishing solid footings for massively heavy towers under water. So the deal was the the caisson is a box upended, sunk down to the river bed, with space enough for men to work in in the free space in the caisson bottom. There would be air shafts and elevators to pull out excavated earth, and as the workers dug down, the caisson would sink, and with each movement enormous blocks of granite would be placed on the top of the caisson to help it sink further. And so this would be the process, digging down through a silty river bottom, pulling out the very heavy muck (having just done some little bit of work on a lake bottom I can tell you that the mud is extremely thick and heavy and difficult to maneuver), the caisson moving down as the earth was removed, continuing the process until bedrock was reached. And then, it was all filled in, more weight was added to the top of the caisson, until that special engineering sweet spot was reached that allowed you to start building the bridge's towers from which the bridge span would be suspended. The work in this case shows the progress on the building of the East River Bridge, soon to be called the Brooklyn Bridge, in 1873, four years into the making, designed by an immigrant, John A. Roebling. The Bridge would be finished ten years later in a titanic task the story of which is beautifully told in David McCullough's Brooklyn Bridge (1980). Department of "What is It?" (#8) What Monster-Pop Mega Thing Did This Become? The original patent for this tube-and-rod design was made at the Danish Patent and Trademark Office in Copenhagen on 28 Jaunary 1958 at 1:58 p.m. The design could be for an associated cooling system for a steam turbine; or for a high-pressure/reactive clutch of passes and cylinders for a water turbine hydroelectric facility; or perhaps it was for a modern prison system utilizing water-filled bars for prison cells that could indicate a possible jail break if any leaking water was discovered, making tampering with the bars an impossibility. The Department of "What is It?" (#7): What are the Ultra Famous Holes that this Hole Puncher Punched? This is one of the most important hole punchers in the history of holes, and also in the history of counting and figuring out what to do with counted things. Do you know who filed this drawing as part of their patent report, and what famous contribution this thing made? I have perhaps four or five pamphlets on gas attacks presented int eh manner of the one I'm displaying today--someone, somewhere did a good and thorough job of cataloging these instructions for a general population on what to do in the event of a poison gas attack. There are also 50 or so items that had once been in the library of the OSS that are similar in presentation/preservation to the gas attack pamphlets, though those all have at least two indications (a stamp and hand written cataloging) stating their point of origin, and the one below does not. The pamphlet is stapled into a manila folder,and opposite it is a worksheet with cataloging details and a fairly extensive abstract of the pamphlet (by hand) in English. Very curious, and interesting. The pamphlet: Notice sur les Mesures a Appliquee en cas de Surprise par les Gaz, printed in France in January 1939 by the Ministere de la Defense National. There is still eight more months of peace to be waged and lost, Hitler already on the move in Czechoslovakia and Austria, and of course Japan already fighting their all-out war in China already for seven years. In a year when the political leader of the United States and his spokespeople have tried to make themselves responsible for defining language and veracity according to their own needs, the word "faked" jumped out to me from the cover of this pamphlet. This doesn't have anything to do with the allegations of "fake news" today, when the presidential press person defines "fake news" as new that does not agree with the vision of the White House and the president himself s impossibly scourges entities like the New York Times as dealing in "fake news", as this is of a particularly high height of an attack on reason and logic. This "fake" is far more localized, and accuses the CIO and John Lewis of sharp moves in extorting money from union members as well as trying to coerce the U.S. into becoming a Soviet America. The thing is, however, that in 1942, the Constitutional Educational League--in business at this point for about 20 years--was one of 28 organizations indicated as having conspired against the U.S. as an agent of the Axis Powers. So there's that.